​This section is designed to showcase some of the work done by colleagues and departments that you're perhaps not so familiar with, explaining how the essential work they do is vital to the support of our clinical wards, outpatient suites and departments. Every single member of staff performs an important role in ensuring our patients receive the best possible care, even those who do not have direct patient contact, so please take a moment to read about the great work being done across the Trust by these incredible teams and individuals. ​Proving that even the most clinical departments rely on the ingenuity and teamwork of non-clinical colleagues, two enterprising young ladies have been instrumental in bringing down the waiting lists and Did Not Attend (DNA) rates in Endoscopy. Laura Bruty and Elizabeth Scarlett both work on the front desk within the unit, booking endoscopy appointments and ensuring the endoscopy lists are fully utilised. 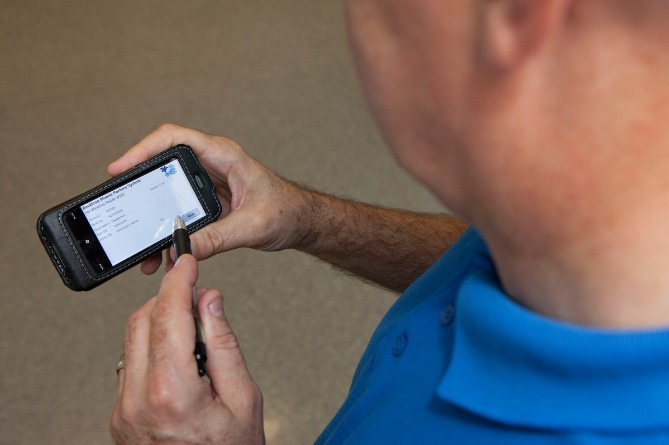 The work they do goes beyond simply booking patients in for an endoscopy test. Their work and attitude to dealing with patients, colleagues and the lists they manage is very much hands on. Laura explains: “We’re always looking at how we can improve the service and Marie is a great manager, encouraging any ideas we have so we feel free to make suggestions. Some of the things we’ve done to reduce DNA rates include looking at those patients who we know will need a follow up or second appointment and book them in before they leave from their first procedure. That way we can offer them an appointment to suit them, so there is less of a likelihood that they’ll cancel. ​“We always look at the patient’s perspective. For them it’s far better to leave the department knowing when they’ll be coming back, they know they won’t be waiting around for us to contact them with an appointment. 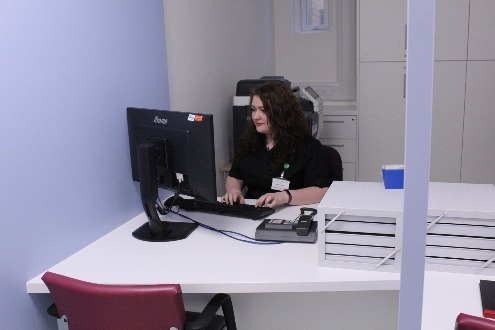 Most patients come round to the Booking Office to book in for their test straight from their clinic appointment. We are then able to meet and greet the patient, and discuss when would be a suitable time for them to attend for their test. Lizzie (pictured above) added: “We do as much as we can in person or over the phone. It’s a much more personable way of dealing with our patients and it means we get to know them better. That way we have a reasonable idea of which patients we might be able to bring in early to fill a cancellation or spare slot at short notice. Marie Allen is their manager, she added: “I can’t praise the work Lizzie and Laura do enough, they’re great to manage and so enthusiastic and conscientious about the work they do, putting the patient first. You can see it in the Friends and Family test feedback that patients really appreciate the work they put in. Pharmacist Prescribers - Just What the Doctor Ordered! ​Over recent years the development of our clinical Pharmacy workforce has focussed particularly on expanding the number of Pharmacists who can prescribe medicines in a range of clinical situations. The Royal now has one of the largest cohorts of pharmacists in prescribing roles who are making a significant impact on the safety and efficacy of medicines used across the Trust. As new clinical roles are developed to support our medical and nursing workforce, an opportunity developed for experienced clinical Pharmacists to develop additional skills that could complement and support the practice of the existing workforce, particularly in areas where the use of medicines form a significant part of patient care. With this in mind a number of ‘Advanced Practice’ roles have been developed to build on the Pharmacists’ expertise in managing medicines, but with additional skills in patient examination and diagnostics. One of these roles is that of the Pharmacist Practitioner within our incredibly busy Emergency Department (ED). Sarah Lock (pictured, right) is a Senior Clinical Pharmacist and performs the role of Pharmacist Practitioner in our ED and explains more about why she took the role, what it involves and how it has developed. 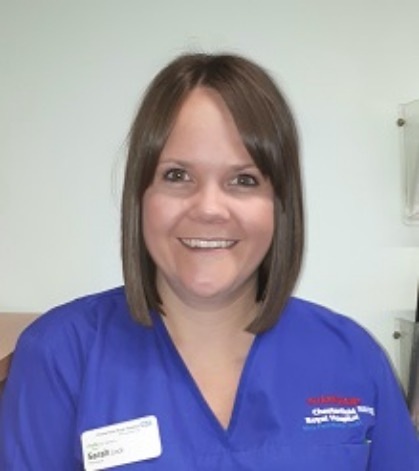 ​Sarah said: “As a Senior Clinical Pharmacist I’ve been based in the Emergency Department for a while following a drive from Health Education England. We knew from previous trials across the country that there was a significant benefit to have a pharmacist based in ED so we decided to trial it here at Chesterfield. We then decided that this would be a great place to develop the Pharmacists’ skills by completing patient assessment, clinical examination and prescribing. “I was on maternity leave when the suggestion of a Pharmacist Practitioner came up, I applied and was successful. When I returned to this new role I enrolled on and completed a six month Advanced Practice in Clinical Skills course at Sheffield Hallam University. “To put this role into context, as a Senior Pharmacist I have been a prescriber for 5 years. I can prescribe regular medications for patients admitted from ED to EMU avoiding delays in patients receiving medication that they would normally take day to day at home. For example, if a patient takes regular medication for Parkinson’s Disease, it is essential that this is prescribed and given in a time critical manner to lessen the effect of worsened symptoms. I am therefore there in the ED to prescribe this medication reducing any potential delay. ​“In the Pharmacist Practitioner role, we can take this further by attaining the skills to conduct a more thorough assessment for a broader patient history. It’s not something a Pharmacist would normally do, and I’m just starting to do that independently, but it means that I can take a look at the ED list and assess the patients that I think may have presented with less complex conditions. “I have a great deal of support from the Doctors and nurses. I can see the patient, take a history, make an assessment and talk through my findings with them to make sure that the assessment and my recommended course of action is correct. If the patient turns out to be more complex than I initially thought then I can hand the case back to my clinical colleagues who can assess them more thoroughly and I will still be able to provide the more traditional Pharmaceutical support. ​“Over time, I can build up my competences, be able to look at our EDIS system and know which patients are more suited to a Pharmacist examination and manage that patient from assessment, through treatment to discharge. By seeing these patients, even if it’s only two or three, it frees up our Junior Doctors and Doctors to see the more complex cases and our patients are seen more quickly. “Of course no two days are the same within a busy ED and I still have my traditional Pharmacy duties to carry out. Having a Pharmacist in an ED is hugely beneficial, reducing prescribing errors, cutting down on delayed medication administrations, intravenous administration queries, timely access to medications not readily available in ED. ​The ability to communicate is part of everyday life that we all take for granted. But just imagine if you were suddenly unable to express yourself, either through the spoken or written word. There are many conditions and circumstances that can affect our ability to communicate. This can include dysfluency, voice disorders, stroke, progressive neurological diseases, dementia, head and neck cancers and even a head injury. This is where our Adult Speech and Language Therapy team comes in. Michaela Wright is the Head of Adult Speech and Language Therapy and has worked in the Trust for 22 years. She said: “The important part of our title is ‘Therapy’. We aren’t necessarily going to be able to cure a speech or language problem, what we aim to do is give individuals the strategies to cope with their change in communication, work on the impairment and work together with them to set therapy goals with the aim of ensuring better lives for people with communication and swallowing problems. Often therapy is about helping the person overcome the psychological barriers that can accompany an acquired communication disorder. 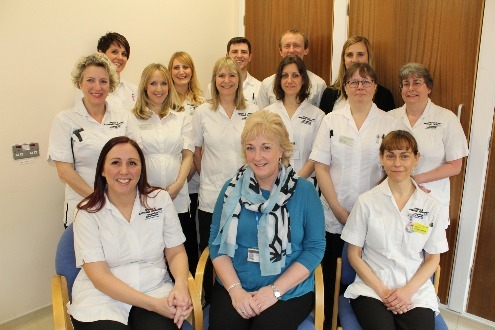 The adult team consists of fifteen Speech and Language Therapists seeing individuals across a range of specialties both on an inpatient and outpatient basis. 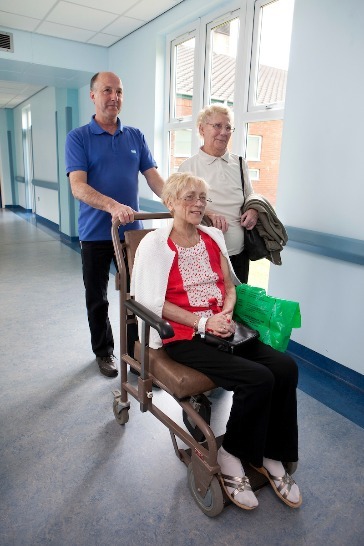 There is an inpatient team for stroke which includes early supported discharge. A team for voice disorders and head and neck cancers, mainly seeing outpatients since the re–organisation of Head and Neck which saw the major surgery moving to Sheffield. There is a medical neuro team that picks up frailty, dysfluency, dementia, Parkinson’s disease and other neurological disorders and any communication and swallowing difficulties referred either from the general wards or to the outpatient services. 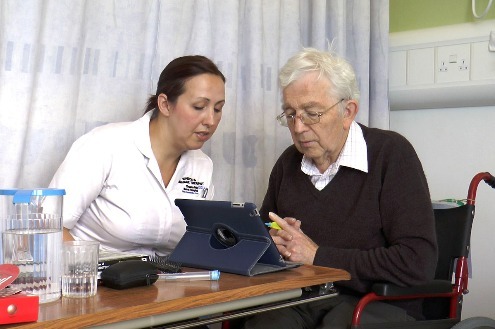 A major part of the SLT role involves the assessment and management of swallowing disorders. Patients are often surprised as the title does not include anything about swallowing but Speech& Language therapists have a good knowledge of the anatomy and physiology of the head and neck and the complexities of swallowing. ​Michaela explains: “A lot of our social interactions revolve around food and drink, just think about Christmas, birthdays, weddings, nights out and summer barbecues. An inability to swallow properly can leave people feeling excluded and isolated so, in addition to the physical symptoms they experience, a swallowing problem can have a major impact on interaction, self-esteem and psychological wellbeing. ​The team sees somewhere in the region of 3,500 patients a year, including 1,400 new patients across the Trust. Around 60% of the people referred to the team will be experiencing swallowing difficulties, 23% of inpatient referrals are for stroke and the vast majority of the inpatient referrals come via the medicine and emergency care division, around 88%. The next highest referrer for inpatients is Orthopaedics at 12%. This brings us to how the type of patient seen by Adult Speech and Language has changed over the years. “A lot has been said about Derbyshire’s ageing population and that is certainly reflected in the patients we see,” Michaela adds. “When I started as a Speech and Language Therapist here in 1995, the top age on the Department of Health yearly return was 85 years. Now the majority of our patients are in the age range of 79 to 97 years and we have many patients who are 100 and over. “We also find that, whereas 20 years ago we may have seen patients purely with speech or swallowing problems related to one disease process, many of our patients now have multiple difficulties contributing to their communication or swallowing difficulties. People are surviving cancers and living longer; as they age they have an increased likelihood of developing something else such as dementia, Parkinson’s or stroke on top of what they have previously received treatment for. Patients are more complex with more co-morbidities and changes in care delivery and available services in the community mean that only the sickest patients are admitted acutely. “For me and my team it is a fulfilling job. We have a good mix of skills with different experiences. Some of the team have worked in other spheres prior to training as SLTs and this life experience stands in good stead along with the wealth of clinical experience in the team. Some of our more recently qualified therapists are very IT savvy and aware of new developments with apps and patient tools available on phones and tablets. We’re living in a time of rapid technological advance and some of the apps are incredibly useful tools and something that we can tap into for therapy to support patients. To find out more about Speech and Language Therapy generally, click here to visit the 'Giving Voice' website. ​When it comes to keeping the hospital moving, there is one element of the hospital team without whom this Trust would literally grind to a halt. The Portering team is often overlooked yet covers every inch of the hospital, ensures that our inpatients get to and from their diagnostic tests, takes care of changing the medical gases, responds to emergency requests and much more. But first a few statistics…did you know that there are 28 full time equivalent porters who work shifts to deal with 90,000 portering requests a year? How about that they move 1,130 tonnes of waste per year from wards, clinical areas and office areas to the waste yards by hand? Pretty impressive! 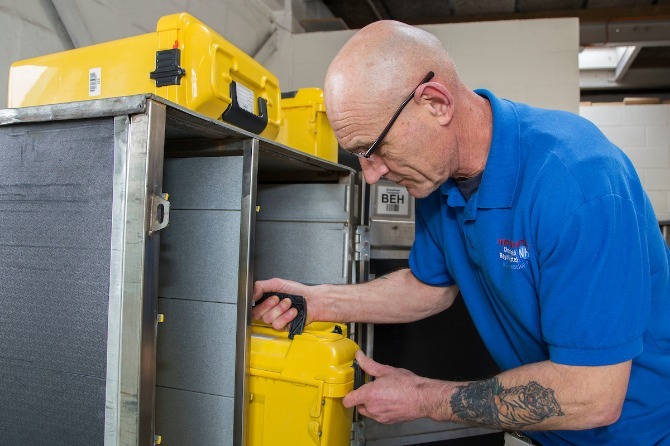 ​Neil Rowley is the Portering Services Manager, he said: “It’s a much harder job than people think, you need four weeks of basic training to start portering and it takes six months to be fully compliant. This is to ensure that we’re certified to use things like Blood Hound, which is the blood handling electronic system, and be sufficiently competent to respond to medical emergencies. It’s certainly not the kind of job you can just walk off the street and be able to do. “We operate 24 hours a day, 365 days a year; between 6am and 10pm there is a task controller in the portering lodge who will allocate tasks. It’s his job to decide who should respond to emergencies and assign the next task, which isn’t always simply the next on the list; there is a strong element of prioritising. Some jobs, such as CT scans, are more urgent because it’s not as easy to re-arrange an appointment and a missed appointment causes cost implications for the Trust. It’s a pressurised job. But not everyone is up to the job and there are a few duties which can catch people unawares and it can be very physically demanding. You may have seen the porters walking the corridors towards the mortuary and this isn’t something that every individual can handle. ​the moving and storage of the deceased as well as helping in their preparation for viewing by relatives. Mortuary jobs take people out of their comfort zone and being in such close proximity to the deceased is something that can be difficult to come to terms with, but it’s part of the job and not something you can opt out of. We have had a few instances where people have left because they can’t handle that aspect but Mike Conway, the Mortuary Manager is very supportive and works closely with us to deliver training and explain what’s required. “It’s also a very physical job and all new starters are required to have occupational health screening to assess the fitness for post. We worked out from when we did the Global Corporate Challenge that our porters’ pedometers ranged from eight to thirteen miles depending on the shifts, pushing and pulling more than your own body weight so you can imagine the physical demands, especially in the warmer months. To book a job on the system then just log onto the Intranet, go to ‘Estates and Portering’, click on ‘Portering Help Desk’ and then ‘Add Request; which will allow you to fill in the details and you will be able to track the job on the screen. 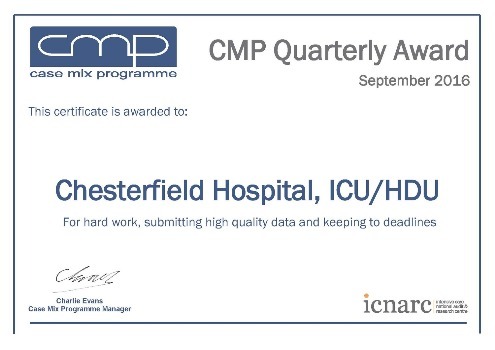 The audit team in our Critical Care has been given a quarterly award for quality. The honour, handed to Senior Staff Nurse Rachael Shaw, Audit Clerk Claire Watson and Senior Staff Nurse Jo Hawes by the Intensive Care National Audit and Research Centre, was presented as a national award for the first time. It recognises the deadlines that are continually met by the team and the high quality data they produce. Rachael said: “We are a small team who work hard to collect and input accurate data for the Case Mix Programme, which is an extensive and continuous audit of patient outcomes from adult, general critical and high dependency care units. The award is a quarterly one and recognises the outstanding work in completing the Quality Reports. It’s a national award so to receive the very first is quite an honour. 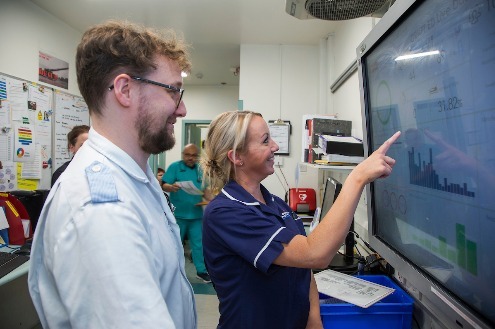 ​“It’s a difficult job,” Jo added, “and there are three new indicators for this year designed to highlight the potentially late recognition of risk, potential issues around delayed availability of ward beds and possible issues around the lack of availability of ward beds. Congratulations to the team from everyone at the Royal!